And then I'd hear him say, "And we're STILL not done." That was Luis Li's darkly fitting catchphrase for his closing argument. "And we're STILL not done." And he said it over, and over, and over… and over. Everything good I said yesterday about a new, improved, less boring Luis Li? I take it back. I take it all back. Li, who originally said his closing argument would take about four hours and later said five, clocked in at over six hours. He spoke for just under three hours yesterday. During a break late today Judge Darrow informed him that he'd been speaking for another three hours today and asked him how much longer he thought he'd be. He only needed about another six minutes he informed the judge. Sheila Polk, who had spent the day listening and taking notes, informed the judge that she did not intend to present her rebuttal today. Because of the equal time rule agreed to for closing arguments, Polk had already accrued approximately three and a half hours and she might need all of it. Mr. Li should take his time finishing, she said. In deference to a juror who'd requested a shorter day, she said she'd prefer to wait until next Tuesday. From a strategic standpoint, that is the smartest thing she could have done. Jurors will have a three day weekend to let Li's closing argument fade from memory like a bad dream. And prosecutors will have the weekend to parse Li's words and craft a fitting rebuttal. There is certainly plenty to rebut and much to clarify. The medical information will have to be broken down again. He worked long and hard to make that as confusing as possible. The key issues are still the relevance of body temperature, dehydration, and, of course, organophosphates. These are the core arguments of the defense's case and he really dug in his heels. Li also went off about the "EMT" recording again. Apparently it was Dawn Gordon -- whose testimony was not streamed by CNN Live -- who claimed to have known that it was an EMT. None of that changes the fact that it was background noise in a recorded interview and was not noted by either the police or the prosecutors. Why would it have been? But I made my feelings on that abundantly clear yesterday. I do think prosecutors are going to have to address the issue of that recording head on and clarify its total irrelevance. The other real sticky wicket is the issue of the medical examiners meeting that caused the first Brady violation before the trial started. 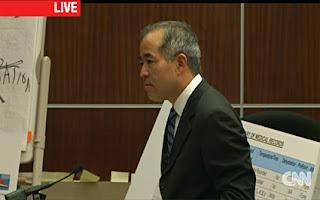 Li made several references to it and to Truc Do's questioning of Dr. Lyon on it. Li tied it into his anti-government theme. This was the State having a "secret meeting" and not about something valid like, say, "terrorism" or any other genuine national security concern. I know the prosecutors got dinged on that and I'm sure the details aren't flattering but I'm equally sure that the way the defense has presented it, spinning bits and pieces for dramatic effect, makes it sound far worse than it was. Another piece of total disinformation I noted was his repeated references to criminalist Dawn Sy. Why oh why didn't the State see the relevance of the 2 ethyl 1 hexanol?!! Ignoring this totally meaningless finding, as per Li, was like an episode of CSI in which the police never came into the lab. Don't you just hate when life isn't like a television crime drama? I do. Like I hate the way Luis Li is nothing like the sharp-witted and succinct attorneys on Law & Order. Worse, Li implied repeatedly that it was odd that the defense had to present Ms. Sy as a witness. Was this really about her vacation in Hawaii? Is that why it wasn't the prosecution who presented this state employee? And meanwhile the jury has "sacrificed" to be there for months and do their "duty." Strangely, Li didn't bring up his own trip; the one that forced a nearly two week break in the trial schedule. Li also didn't mention that, not only was Dawn Sy on the prosecution's witness list, she was in the hall waiting to testify in that capacity and was bumped by another witness's testimony that ran long; no doubt because of one of the defense's endless cross-examinations. Apparently Mr. Li has no recollection of this fact which was aired out thoroughly during Bill Hughes's cross-examination when Dawn Sy came to testify as the first of two, count 'em two, defense witnesses. He also tried to give Ray credit for the nurse but, of course, we know that she wasn't hired as a Dream Team volunteer for that reason. It was a fluke. In fairness, Li did not mention the first aid kit which, while insufficient, would certainly qualify as a suitable precaution. Other than that, the CPR training of Melinda Mullin was the only really legitimate preparation. Telling people to hydrate was certainly a good idea but it was severely undercut by the fact that he did not tell people about the "heat endurance challenge" they'd be facing that made it so necessary. Many witnesses have testified that they would have been more diligent about hydrating had they known. It's also pretty well negated by the fact that he put people on a total fast -- no food or water -- in the desert during the 36 hour vision quest the day before the event. The buckets and hoses and the items at the recovery station were supplied by Angel Valley and witnesses have testified that it was their staff that came up with those ideas after witnessing the distress of participants in previous years. And finally, the speech. What to say. The speech was the opposite of good preparation. In it he told people to ignore their feelings of impending death. He assured them that they would not die. He told them to "transcend" their body's warnings and discomfort so that they could have the transformational experience they were paying for. Li's attempt to cast Ray's grudging acknowledgment of all those non-samurais who couldn't cut it, that they could leave only between rounds, as responsible preparation was just embarrassing. Li went to great lengths to say that what happened could not have been properly prepared for because it could not have been foreseen. He showed photos of all the people from the 2008 event to prove that nothing like this had ever happened before. But, as I've said on numerous occasions, what gives the lie to that entire argument is that neither Ray nor his staff members registered the signs of increasing distress as that day unfolded. They acted as if there was nothing new or unexpected about it. Even at the very end when the full horror was brought out into the light of day and chaos ensued, Ray remained unconcerned, saying that one delirious participant was just having an out of body experience. No big deal. After all, he'd announced before the sweat lodge that people not knowing where they were was due to the altered state experience they were striving for. 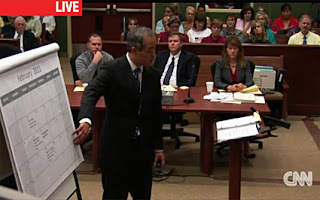 Li went on at length and repeatedly about how Ray could not have known because "no one knew." But, in fact, many people did know something was wrong and that people were in trouble. Many of them called out to Ray, the master of the lodge, for help and guidance. And he told them to ignore the problems. He told them to leave unconscious people where they were. He told them to wait to the end. He told them that people with labored breathing and disorientation were fine. One of the more sickening elements of Li's presentation was his constant jabs and outright ridicule of those witnesses who did not conform to the defense's theory. He was openly disparaging of people, not just because of what he implied was false testimony, but for who and what they were. He got very personal and very nasty in his criticism. He singled out Beverley Bunn repeatedly and in the strangest wrinkle disparaged her repeatedly for being a dentist. Mr. Li's personal brand of elitism expresses itself in some of the oddest ways. Just weird. But he trained the big guns on the Hamiltons and Fawn Foster. And as the defense has done before, he mocked them openly for their spiritual beliefs. This fierce defender of the First Amendment of the US Constitution used their spiritual beliefs to undermine their credibility in a court of law. And he did so over and over again. As I've said before, their belief that insects and rodents are sentient creatures who can be communicated with is not unique. It's common, in particular, among indigenous peoples. The hypocrisy of his open mockery of these people, after his impassioned defense of James Ray's right to quote Revelation and call himself God, is outrageous. I guess Mr. Li's principled stance on the personal liberty we enjoy as Americans has its limits. We got the good folks at Angel Valley. That's how we know. And that's a guy comes in and says, my first line of defense is to talk to the uh, the ants. Well, one of the folks back there told me there's a cricket, there's another cricket, okay, um. Uh, I don't think any of us can convince that cricket through the power of our thoughts, words, or, whatever to get out of here. You gotta get him in a cup. Put him in and let him go, or kill him, or whatever. So, what you gotta believe, ladies and gentlemen, beyond a reasonable doubt, is this man who comes in and says all that stuff to you. He says rats eat all the poison like that. [snaps fingers] You know? Oh and I talk to the critters and I tell 'em to get outta here. And that's why that's the only time, the only one time, ever that they've used ant poison, 'cause they know. And remember he has this great phrase: Uh, well that's my truth. You know, that's my truth. You don't get your own truth. I mean nobody gets their own truth. I mean Abraham Lincoln said, "You're entitled to your opinions -- your own set of opinions -- but you're not entitled to your own set of facts." That's not how it works. You don't get your own truth. You get the truth. Now I could go on at length about the many problems with notions of objective, ultimate truth; particularly as it pertains to religion. Here's a hint: One result is state sponsored religion as opposed to freedom of. But the part that really had me reeling was Li's Abraham Lincoln "quote." I have never heard that aphorism attributed to Lincoln. So I did a little googling to check my own sanity. I couldn't find a source that quoted Lincoln as having said it. Now he may have said it at some point because it is a common aphorism. It is most commonly attributed, not to Lincoln, but to the late senator from New York Daniel Patrick Moynihan. He happens to have used the phrase on the record, so some give him credit. Try to wrap your head around the layers of irony, here. Libertarian firebrand and rabid defender of the Constitution Luis Li is openly mocking a man for daring to have is own sense of spiritual truth, so he presents a quotation about the importance of being factual and totally misstates the facts about that very quotation. That is Luis Li in a nutshell. Note to readers: As stated, in addition to being boring, tangential, and hopelessly confusing, Li's closing argument went very, very long. As closing argument will now go into next week, I would not take it for granted that CNN Live will continue streaming. Please take a moment to shoot them a request using the form link at the top of this page. (From the drop down list on the form, choose Live Video.) They have demonstrated at least some willingness to consider viewer requests. If you're on Twitter, you can also send them tweets. So contact CNN and tell them you want the stream to continue next Tuesday.